I have been working on the Pages Gallery section of the blog to show other aspects of my work, and to make some sense of how I could develop this site further I went for a consultation with David Abbott at Chesapeake Design in Bristol, who specialises in Word Press systems. 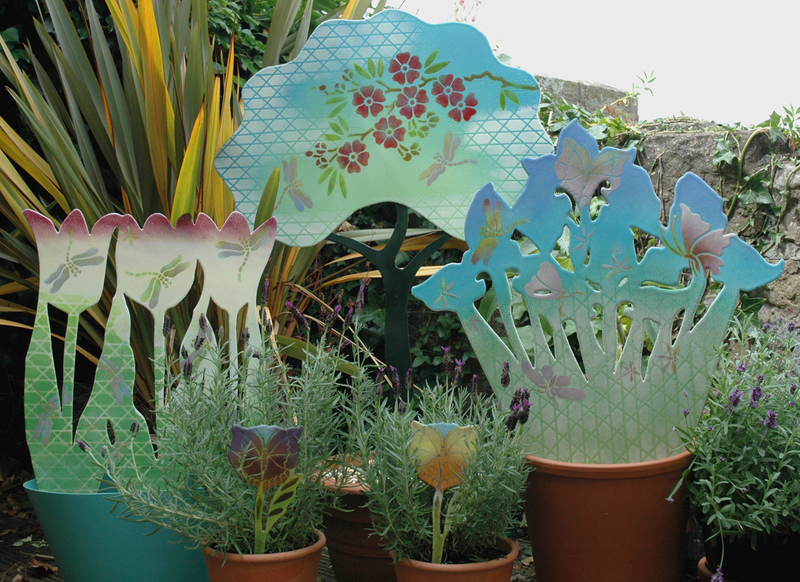 I have already got the Hearts section organised for the Pages Gallery, but now I want to start to show other areas of my work which are important to me, like my enamelled garden. 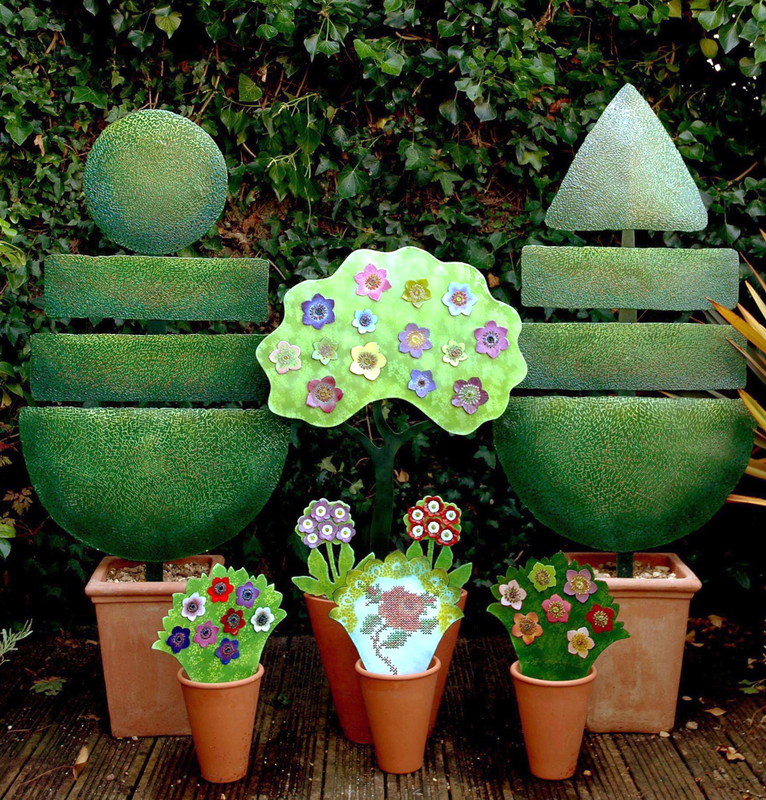 The Enamelled Garden was a research and development project, funded by Arts Council England, that I undertook several years ago. 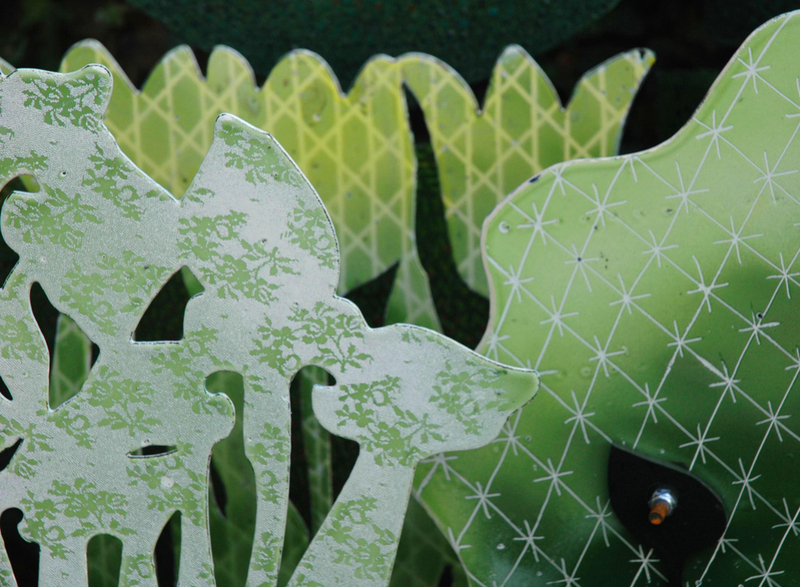 The idea was to develop my stitched work into another medium, vitreous enamel, and I undertook to develop “collections” of different types of fabrics to decorate large scale metal sculptures for gardens. The collections comprised, embroidery, lace, chintz, Japanese stencils, crewel-work and darned topiary. The decoration was taken from my past work which has always featured traditional embroidery designs and techniques. I liked the idea of making weather resistant textile designs – enamel can last indefinitely – unlike fabric when exposed to light and weather. 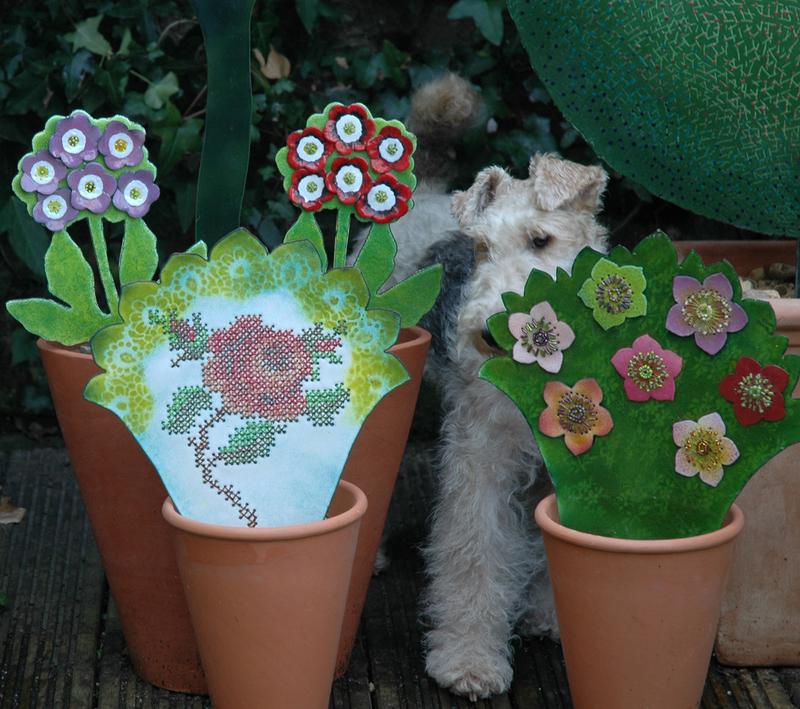 detail of embroidered and beaded collection with Fox Terrier. 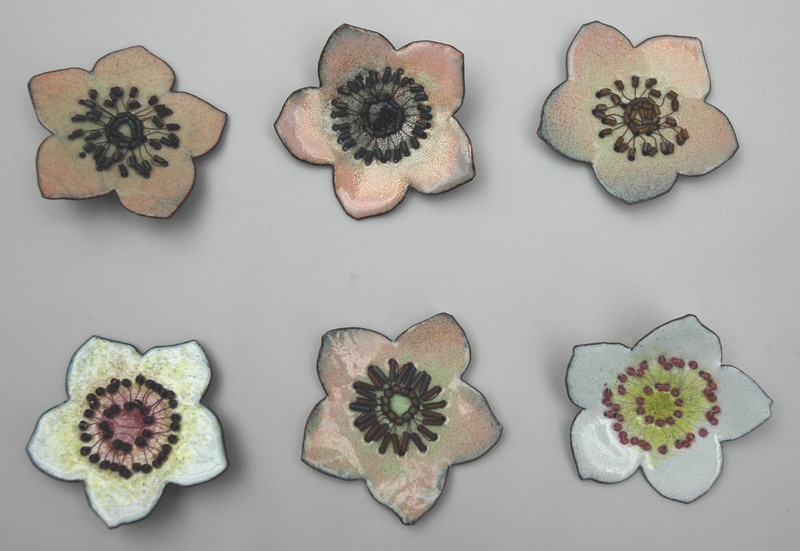 selection af enamelled backs of garden pieces. the first samples for the pansy faces, cut by a hand held plasma gun. 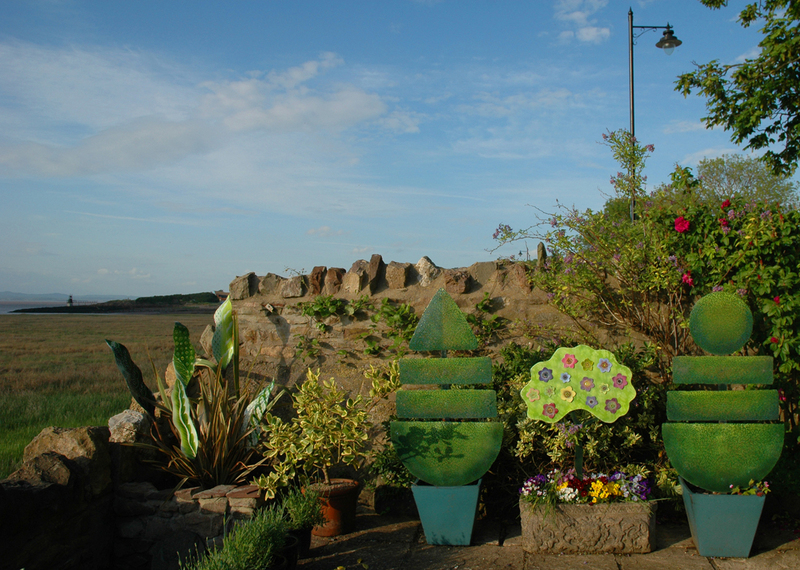 The whole of the finished garden project and the later additions are now included in Pages Gallery. It has been widely exhibited, I have lectured about it several times and it profoundly changed my working practice. I am now the proud owner of 2 enamel kilns, my small kiln takes plates up to 30×30 cms and my large kiln will take a piece of metal 45 x 60 cms – just about half a yard of fabric! Both these kilns were made to order from the Northern Kilns Company, as was the industrial sized UWE kiln. The garden however now lives with me as part of a constantly changing set of sculpture in my own garden, the pieces get moved about as and when I need some changes, and they are particularly useful in the winter even though they are now well weathered by all the wind, spray and water that the Bristol Channel throws over our garden wall. 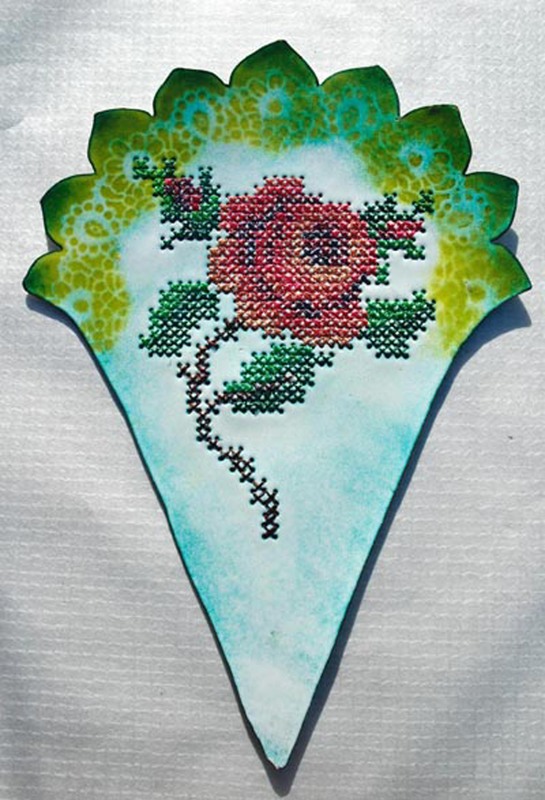 the first garden flower - cross stitched rose in coloured wire. Originally I had decided to embroider the entire garden, so my first piece was this cross stitched rose, it took 3 days to stitch in wire and that was after a week spent, cutting, drilling just under 300 holes and then enamelling – the skin on my hands was shredded while stitching the wire; 5 stitches at a time was all I could manage as the copper wire broke with the friction of the repeated action entailed in stitching. 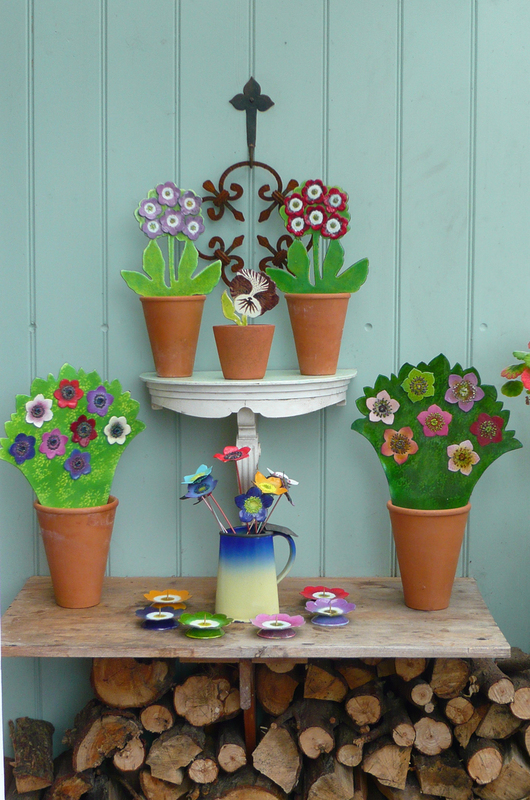 Time to re-think, the next set of flowers was beaded and appliqued into position, this lead to many variations. selection of small white beaded flower heads, destined to become brooches. 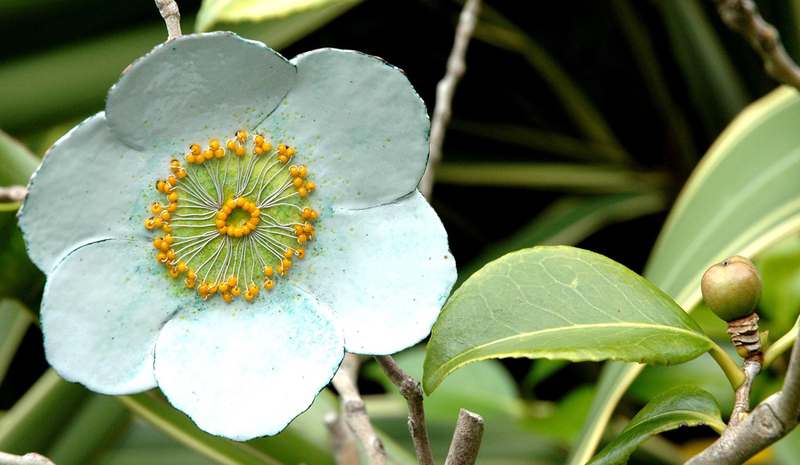 enamelled single flower on camellia bush in summer. 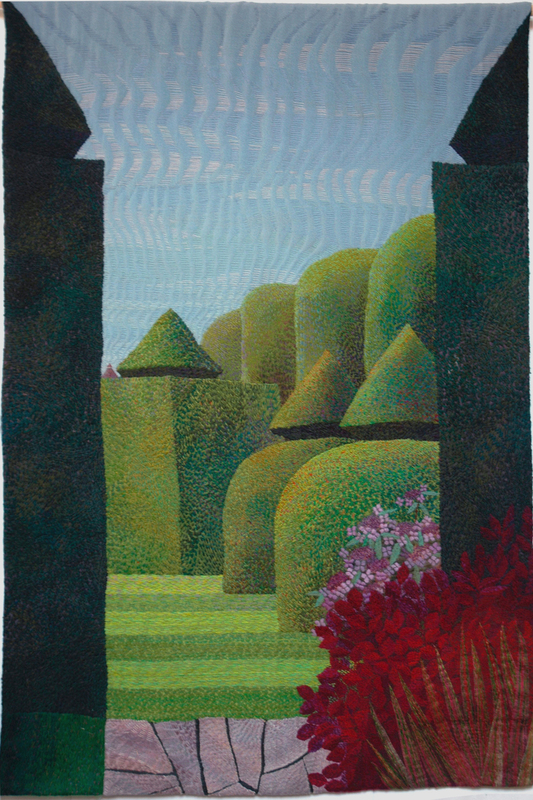 Once I had placed the enamels into my own garden I had lots more ideas; the original garden had been planned on paper to enable me to create costs for the grant and working patterns for the metal workers. Left to my own devices things started to develop. Copper distorts in the heat of the kiln, now instead of trying to flatten it I just let it happen more, suddenly the leaves had a life of their own. 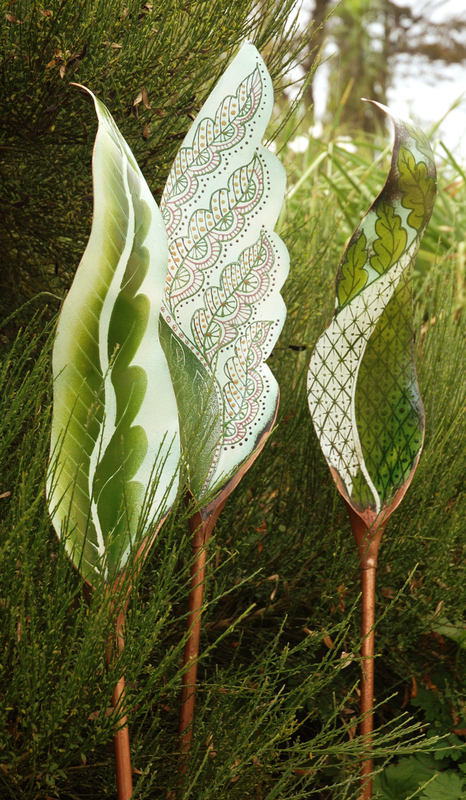 crewel work leaves twist and turn around their copper tube stems. 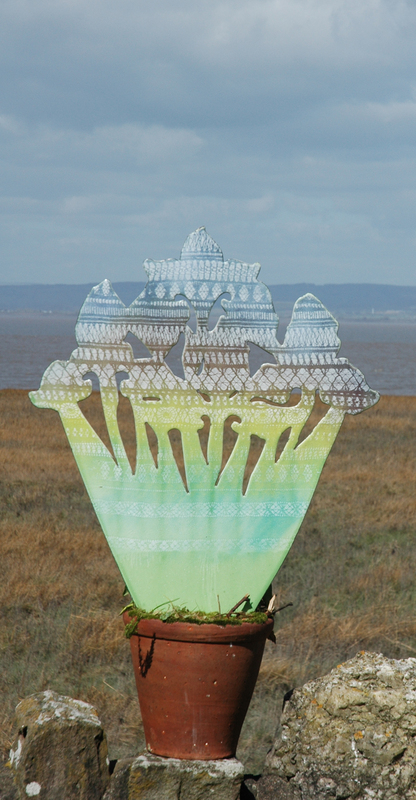 Last year 2009 I opened my garden to the public as part of North Somerset Arts Week and so I set out all of the garden pieces out and made lots of new sculpture for it as well. 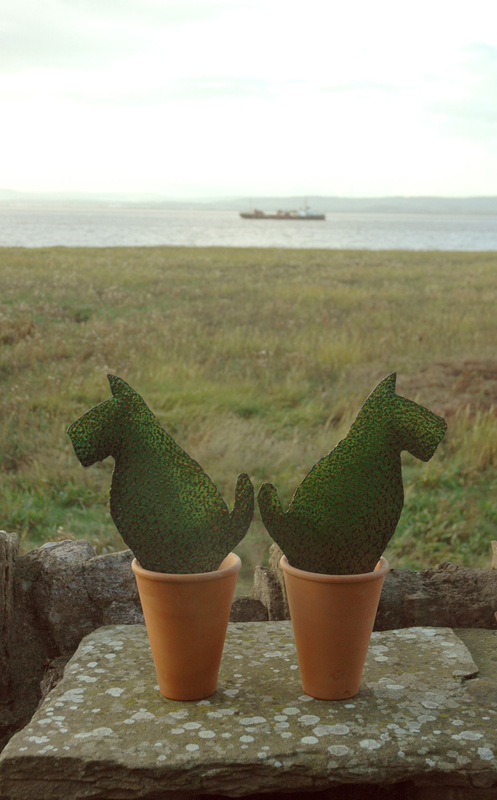 potted topiary terriers keep guard over the estuary. seascape iris seen against the inspirational view form the garden. 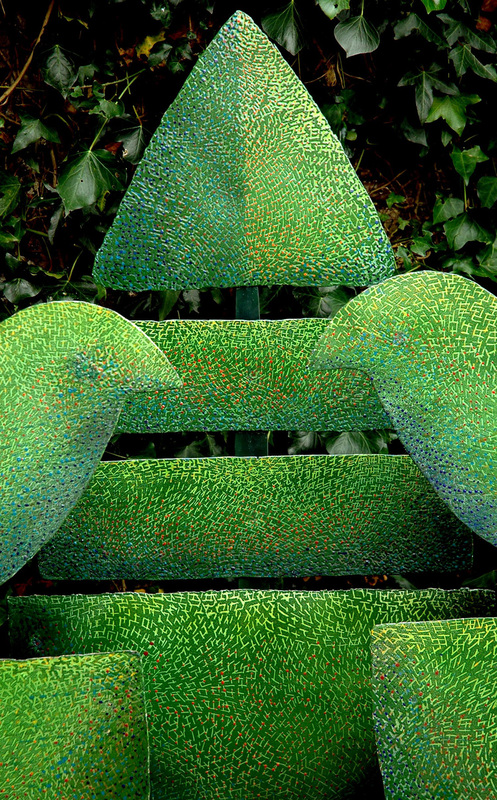 I worked with a garden designer Julie Dunne, of Trug design company, and she helped to get the garden more balanced to integrate the enamels more easily into the existing scheme. She recommended making a series of irises that reflected the colours and striations of the sea scape. 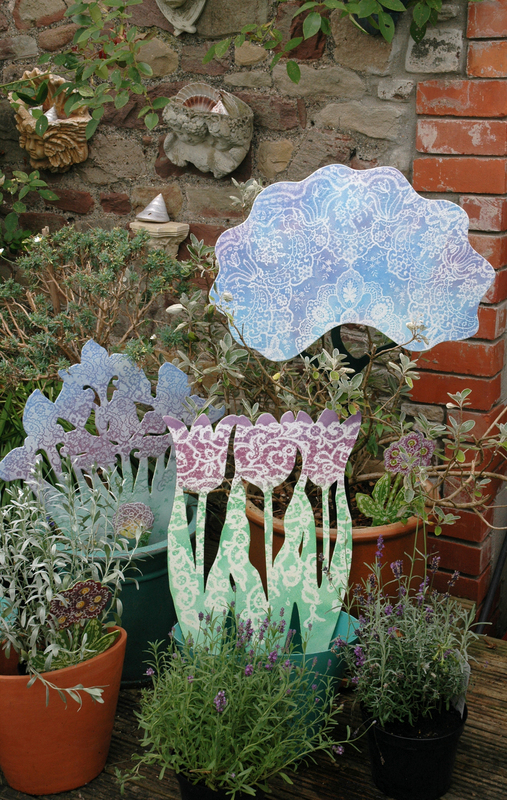 On her advice I made some garden screens, enamel hangings tied together with wire they led me to make a series of other stitched enamel panels ( watch out for these later) the Quercus Curtain was first trialed on the open studio garden week. Even the small wood store at the back of the house and which is stocked with wood washed up onto the beach in the winter gales, was decorated for Arts week. Below is an arrangement of enamels in pots for the North Somerset Arts open studio week, things tend to just get rearranged on a regular basis. 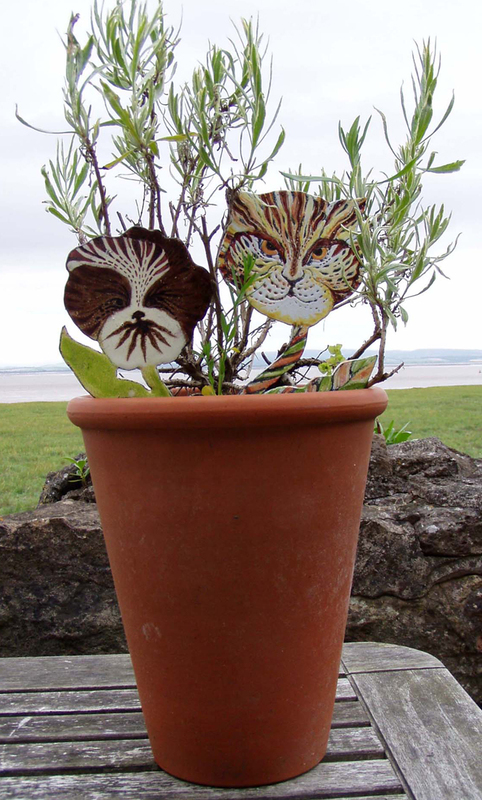 I can just be seen talking to visitors in the enamel studio, and by chance when I looked at the visitors I realised they were Angela and Alban, whose wonderful garden in Somerset I visited this weekend was open for the National Garden scheme. 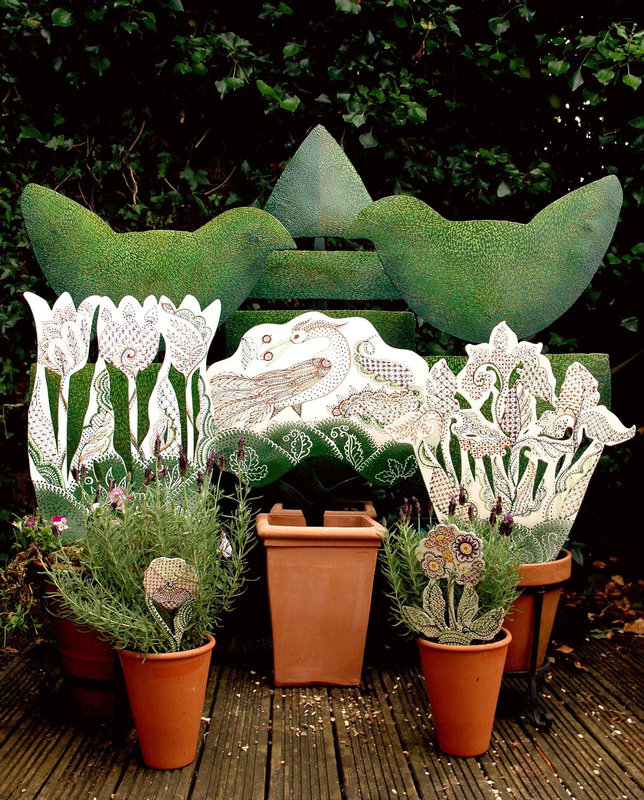 This has been featured on Rosemary Murphy’s blog Share my Garden, where I can be found hiding behind a pair of sunglasses and a sun hat all “dressed up like a dish of fish”, to quote Rosemary. I’m wearing a pink frock which I recently swapped with Kay from Blaze gallery for a bag of my best fabric scraps for making her jewellry – the dress had belonged to Hanne but she had given it to Kay to cut up for her beads but then I saw it and tried it on…….but that’s all another story. 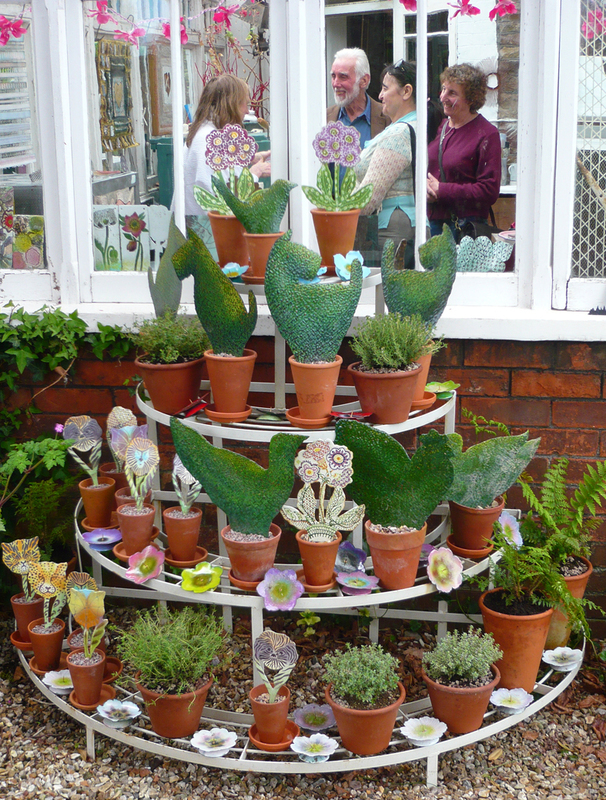 Categories: The Enamelled Garden | Permalink. Absolutely fascinating. I love UK artists.